A highly nourishing soap made with fresh cowﾒs milk infused with Saffron & Organic honey. The cowﾒs highly nutritious feed gives rich thick creamy milk with a high fatty content. 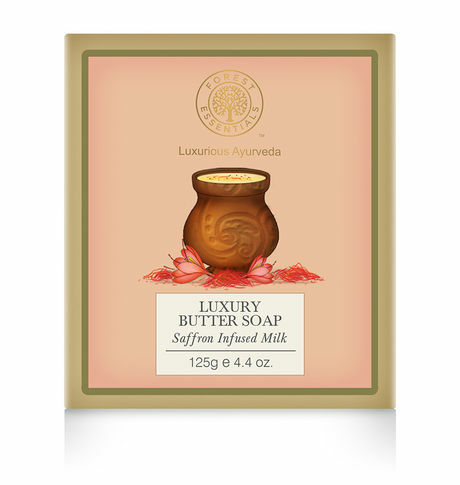 This Saffron Infused Milk Butter Soap contains the benefits of natural organic oils of Coconut, Palm, Almond along with Kokum and Shea Butter. Herb infused ingredients, like Anantmool, a potent Ayurvedic herb smoothes and retexturizes the skin. Made with Natural spring water and infused with Saffron this soap leaves you with soft, nourished skin.